Cape Town hotels offer an amazing choice of hotel accommodation for all budgets. Cape Town South Africa offers some truly magnificent hotels with charm and chacter. Hotels located with views of Table Mountain and Table Bay of Cape Town. Enjoy the amazing cuisine of Cape Town including the marvelous seafood. Table Mountain is one of the world's MUST SEE locations! Have a time of wonder and delight in glorious Cape Town! We wish you a fabulous visit ! 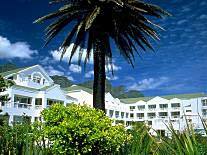 Kaapstad Hotels, accommodation Kaapstad, Cape Town Hotels and accommodation in Cape Town South Africa. Cape Town hotel reviews. It is in perfect harmony with the backdrop of Table Mountain, the historic working harbour and the yacht bay. The Table Bay Hotel is a five-star, 329-room hotel and it uniquely responds to its magnificent surroundings. It has a maritime flavour that extends to each room and suite, which has sea or mountain views and is a luxurious port of call. The Protea Hotel Dolphin Beach is perched on an endless stretch of powdery white beach, faced the sun-dappled sea and magnificent Table Mountain across the bay. The Peninsula's 110 truly oversized and luxurious suites offer magnificent views of the Atlantic Ocean and Robben Island. The Peninsula is all about suites - from one-bedroom mini-suite to the magnificent three-bedroom Royal suites. The Peninsular is an ideal choice for your visit to Cape Town South Africa. 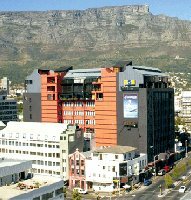 The Protea Hotel Pier Place is conveniently located at a prestigious address in Cape Town's CBD. It invites the discerning traveller to experience the pleasure of a truly distinctive establishment that offers both excellent service and sheer luxury. Just 20 minutes from Cape Town International Airport, only five minutes from the dazzling Victoria & Alfred Waterfront and majestic Table Mountain and within walking distance of the new Cape Town International Convention Centre. The Mediterranean-style Protea Hotel Sea Point is located on the doorstep of the Atlantic Ocean, where long white beaches beckon with majestic Table Mountain and Lions Head in the background. Within easy reach of the Victoria & Alfred Waterfront, the Protea Hotel Sea Point is near to many famous attractions, the wine routes and beaches of the Cape. Sightseeing trips can include Cape Point, Table Mountain`s cableway or the Castle, while evening entertainment in Sea Point includes a vibrant nightlife offering theatres, late-night hot spots, as well as a host of restaurants and pubs. The Protea Hotel Sea Point offers a choice of 123 sumptuous rooms, each furnished in distinctive style. Stylish and spacious, all rooms offer breathtaking views of either the ocean or mountains. Cape Town places to stay and lodgings and reviews in Cape Town South Africa. Last Minute Cape Town hotel availability and Last Minute hotel bookings for Cape Town Hotels.